The Wednesday, Sept. 19, fire was kept from spreading into adjacent companies on Southwest 18th Avenue. 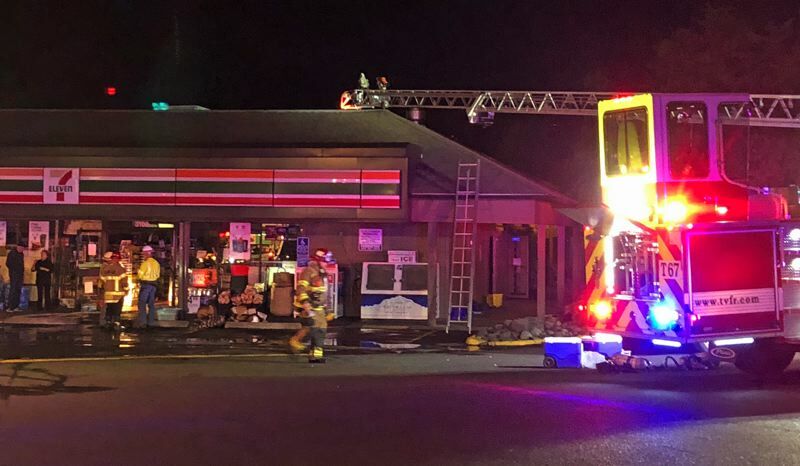 Just before 10 p.m. Wednesday, Sept. 19, firefighters from Tualatin Valley Fire and Rescue were dispatched to the report of a fire at a 7-Eleven store at Southwest 185th Avenue and Bronson Road near Highway 26. Firefighters say a quick-acting employee at the store made the call to 911 while also evacuating other employees and a customer. Crews arrived to find heavy black smoke inside the store and billowing out the eaves of the roof. As crews battled the flames, they found a significant amount of smoke in the attic space, suggesting the fire might have been spreading. The incident was upgraded to a second alarm to bring in more resources. The fire was considered under control in approximately 30 minutes. Firefighters were able to keep the fire contained to the store, protecting connected businesses. Store employees and the customer evacuated unharmed and businesses in the connected units were closed at the time the fire broke out. Due to extensive fire and smoke damage, the store will be closed for an unknown period of time while restoration work is performed. TVF&R was assisted on scene by Hillsboro Fire and Rescue, NW Natural and Portland General Electric. MetroWest Ambulance provided medical standby services.